Rileigh Jo Evitts ’19 and Brad Nolan ’19 each selected Lebanon Valley College because it offered a great academic atmosphere along with the opportunity to continue playing the sports they love. 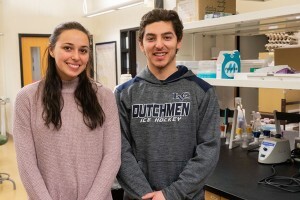 While they have different goals for the future, they are bound together as student-athletes and as part of the neuroscience cohort of students. They recently took a break from their sports seasons to share how summer internships are bringing them one step closer to reaching their career aspirations. Evitts, who arrived as a transfer student at LVC and is an all-conference forward on the soccer team, interned at the Surgery Center of Pottsville as a clinical and administrative assistant. A coincidental meeting with one of their doctors led first to a shadowing experience and then the summer internship. She assisted with electronic medical records and with patients in the post-anesthesia care unit (PACU). “I was responsible for tasks including transporting and assessing patients, restocking medical supplies, maintaining a clean environment for patients, and responding to specific patient requests,” she said. For Evitts, whose ultimate goal is to complete her doctorate and become a neuropsychologist, the internship provided meaningful work experience. “I was able to work within a fast-paced medical environment, assisting with pre- and post-operational care in the PACU while strengthening my social skills,” she said. As Evitts is focusing on a medical career, Nolan is leaning toward a future in neuroscience research. 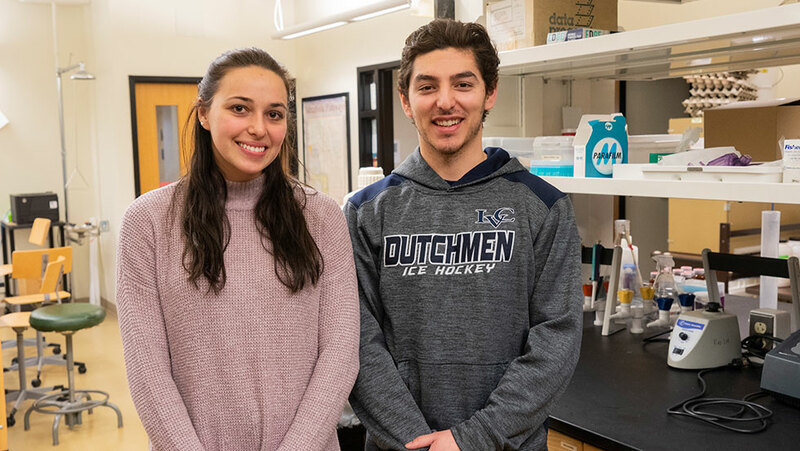 Nolan, a defenseman on the men’s ice hockey team, participated in Penn State Hershey’s Summer Undergraduate Research Internship Program. He used connections from a previous LVC research project at Hershey to secure the internship. Nolan worked in one of the laboratories that used mice to study the relationship between various drugs that act on the cannabinoid system (biological system) and behavioral components such as chronic pain, drug tolerance, and anxiety and depressive-like symptoms. While LVC prepared him for the internship with background knowledge on the brain and proper laboratory procedures, he also gained valuable skills from the internship that he will carry forward. After LVC, Nolan will attend the University of Pompeu Fabra in Barcelona, Spain for a master's program focusing on the brain and cognition. “Ultimately, with neuroscience riding on the frontier of technology today, I hope to use my skills and knowledge to work in the tech sector to find better ways to understand, stimulate, and possibly heal the brain,” he said.